Harmanie Taylor is a proud disabled dance artist living in Vancouver, BC. She has been actively involved in the integrated dance movement as a dancer, performer, teacher, mentor and organizer since 2006. She has had the pleasure of studying with dance companies such as Axis Dance (US), Candoco Dance Company (UK), Amici Dance Theatre (UK), MoMo Mixed Ability Dance Theatre (AB, CAN), and DanceAbility International (USA). 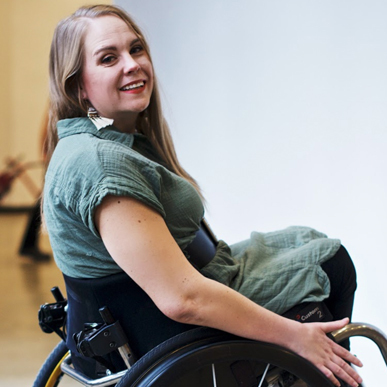 Harmanie has worked with CRIPSiE (AB), RealWheels Theatre (BC) and is a co-facilitator with All Bodies Dance Project. Her latest work premiered at the Vines Art Festival in 2017. She holds a BA in Dramatic Arts from the University of Lethbridge and an Arts and Cultural Management certificate from MacEwan University.